Sodium Sulfacetamide (10%) and Sulfur (5%). Arabica gum, benzyl alcohol, cetyl alcohol, dimethicone, disodium EDTA, emulsifying wax, fragrance, glycerine, glyceryl stearate (and) PEG-100 stearate, isostearyl palmitate, nicotinamide, phenoxyethanol, purified water, sodium lactate, sodium thiosulfate and zinc oxide. GENTLE NO IRRITATION NON DRYING/VERY HYDRATING SUDDEN RASH/HIVES I have extremely sensitive skin/mild rosacea. 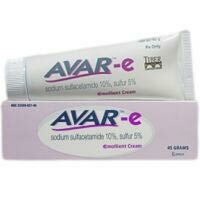 My derm recommended avar cream when most other topical acne creams had caused irritation and did not work. I used for 5 months with great and immediate results! No dryness, redness, or irritation! Cleared up all my moderate acne. I suddenly developed a rash/hives one day a few hours after applying the avar cream. I was told to stop use for a week, the rash went away, I used again, the rash re-appeared! I'm not sure if anyone else has experienced this, but I can't find anything online for Avar products. I'm so bummed out as this product has worked wonders for my acne. I recommend this product, but please keep this in mind. This product has also been discontinued/unavailable for quite some time when I first started ordering. Not sure why, but the company had to pull all products and I had to wait a few months to get it!